This week's Torah portion deals with the building of the Tabernacle and its vessels. This offering is voluntary, coming from "whosoever is of a willing heart". Will the Jewish people reveal enough generosity to contribute what is needed? What's the difference between a Jew and a pizza? A pizza doesn't scream when you put it in the oven." Did you laugh? I don't find this funny at all. As I child I was hurt when I heard such stupidity. How do you drive a Jew crazy? Put him in a round room and tell him that there is a penny in the corner. This depiction of a Jew did not describe anyone that I knew. But the people who told these jokes and laughed at them were apparently convinced that the stereotype was accurate. Update: Soccer Dad is right! It's an almond tree, or in Hebrew shaqed or sheqeidia. וַיְהִי דְבַר-ה' אֵלַי לֵאמֹר, מָה-אַתָּה רֹאֶה יִרְמְיָהוּ; וָאֹמַר, מַקֵּל שָׁקֵד אֲנִי רֹאֶה. וַיֹּאמֶר ה' אֵלַי, הֵיטַבְתָּ לִרְאוֹת: כִּי-שֹׁקֵד אֲנִי עַל-דְּבָרִי, לַעֲשֹׂתוֹ. There is a play on words here. The word for "almond" (shaqed) is similar to the word shoqeid which is translated her as "watch over". Shoqeid could have been translated as "being diligent" or "being assiduous". 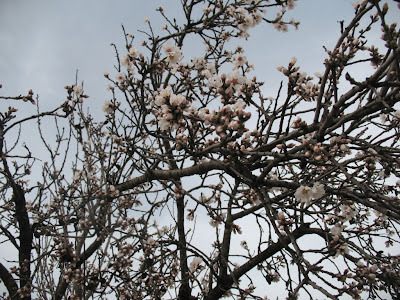 The almond tree blossoms at the end of the winter, before most if not all of the other fruit bearing trees. Just as the almond blossoms quickly, so G-d will act quickly to fulfill His word. 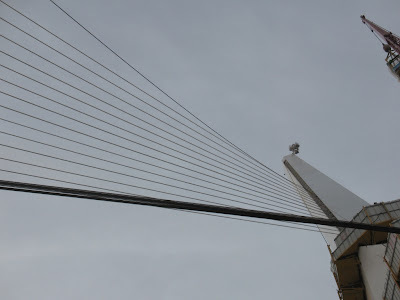 Similar to Calatrava's earlier (1992) design, the Puente del Alamillo in Seville, Spain, this subtype does not balance forces by using a symmetrical arrangement of cable forces on each side of the tower, but rather makes use of an angled cantilever tower loaded by cable stays on one side only, and consists of a single pylon counterbalancing the 360 metre span with lengths of cables. While this leads to a less structurally efficient structure, it makes a dramatic architectural statement. Yes, it does make "a dramatic architectural statement", kind of like the Leaning Tower of Pisa. I hope these guys know what they are doing! There are innumerable traits; for as all of a person's worldly actions, so are his traits. It is from them that his actions flow. But just as we discussed those mitzvoth which there was a greater need to consider, because of the greater frequency of lapses in relation to them, so shall we discuss the chief traits in greater detail because of the relative frequency with which they come into play. These are pride, anger, envy, and lust - all evil traits, whose evil is widely recognized and need not be demonstrated. They are evil both in themselves and in their results, for they are all outside the realm of intelligence and wisdom. Each one of them has it within itself to lead a person into severe sins. In relation to pride we are explicitly warned (Deuteronomy 8:14), "And your heart will be proud and you will forget the Lord, your God." Concerning anger our Sages of blessed memory said (Shabbath 105B), "One who becomes angry should be in your eyes as one who serves idols." Unquestionably, Humility removes many stumbling blocks from a man's path and brings him near to many good things; for the Humble man is little concerned with wordly affairs and is not moved to envy by its vanities. Furthermore, his company is very pleasant and he gives pleasure to his fellowmen. He is perforce never aroused to anger and to controversy; he does everything quietly and calmly. Happy are those who have been privileged to attain this trait! Now the man Moses was very meek, above all the men that were upon the face of the earth. And Moses turned, and went down from the mount, with the two tables of the testimony in his hand; tables that were written on both their sides; on the one side and on the other were they written. And the tables were the work of God, and the writing was the writing of God, graven upon the tables. And when Joshua heard the noise of the people as they shouted, he said unto Moses: 'There is a noise of war in the camp.' And he said: 'It is not the voice of them that shout for mastery, neither is it the voice of them that cry for being overcome, but the noise of them that sing do I hear.' And it came to pass, as soon as he came nigh unto the camp, that he saw the calf and the dancing; and Moses' anger waxed hot, and he cast the tables out of his hands, and broke them beneath the mount. One should not be a madman that angers easily, and not like a cadaver that has no feeling. One should be in between; one must not get angry unless he is dealing with a very big, important matter that is fit to get angry about, in order that people won't repeat it. No doubt that the sight of the Golden Calf and the dancing, so soon after the giving of the Torah, was something to get angry about. But what about the Ramchal who said that a humble person is "never aroused to anger"? IMHO he agrees with the Rambam, that in rare, special cases even one who is humble can get angry. However, everyone agrees that anger is a negative character trait that must be avoided. Am I the only one who thinks that the upcoming presidential elections are nothing but a popularity contest? The only issue that I am aware of is the American military presence in Iraq. I would really like to see a table that would summarize the candidates and their positions with regards to the issues. The rows of the table would contain the issues, and the columns would contain the names of the candidates. Does something like this exist, or is the public more interested in what the candidates eat for breakfast? I know that sounds strange coming from me. It isn't easy for me to write it. In fact, I went to my rabbinic mentor this week to get ammunition in my debate against Fishman. He is one of the well known and respected leaders of the UltraOrthodox world in Brooklyn. When I explained the reason for my visit I received the surprise of my life. He said that Fishman was right, that living in Israel was a mitzvah beyond all measure, and that anyone who could go there certainly should. When I asked him why he didn't announce this publicly he smiled and said, "Do you want me to be banned by the other rabbis?" He also answered that one is not allowed to teach something that a majority of the community cannot observe, and this is the case with aliyah since it is not practical for many families, and his task is to strengthen them in their Yiddishkiet until Moshiach comes, but that anyone who could go to Israel is certainly performing a great mitzvah. My head is still spinning around. But I gathered from his answer that I owe Mr. Fishman an apology for some of the things that I wrote. Also, if I led other Jews astray, I am sorry. A truly great and enlightening talkback. The Ethrog is red. Usually an ethrog is green, yellow, both, or something in between. But today the ethrog is red. When he was younger he was yellow-green like most ethrogs. But even then the ethrog wasn't really kosher. He tried to pretend that he was, however he had small black spots on his snout. Only the wise knew that he was pasul. Today however, even the common folk know that the ethrog is chaser, part of the ethrog is missing. He lacks a heart. The ethrog is interested in money and power. He had no interest whatsoever in his brothers whom he is obligated to defend. People are murdered, young children are maimed. 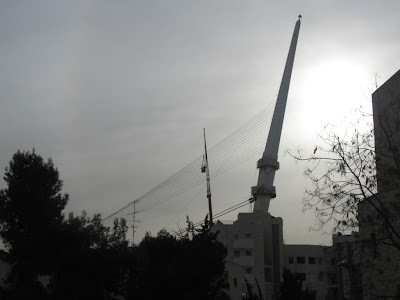 As the rockets rain down on Sderot, the ethrog is busy with other matters. Who cares about Sderot? Let them eat kassams! Then the ethrog started turning red. The spin masters of the Israeli MSM shouted "KOSHER, KOSHER". But the ethrog was far from being kosher. The oketz fell off and the pitam was broken. The spin masters, those emotionally and intellectually deficient robots disguised as human beings, shouted "KOSHER, KOSHER" even louder. Then the spin masters looked at their own hands. Their hands were full of blood. The blood of the children of Israel was all over their hands. The spin masters were not embarrassed. They took the bloody red ethrog in their bloody red hands and kissed it. It's been a while since I posted a "mystery tree". But this one is really isn't such a mystery. Do you recognize it? Update: Rafi got it. This is a carob tree. One day he was journeying on the road and he saw a man planting a carob tree; he asked him, How long does it take [for this tree] to bear fruit? The man replied: Seventy years. He then further asked him: Are you certain that you will live another seventy years? The man replied: I found [ready grown] carob trees in the world; as my forefathers planted these for me so I too plant these for my children. Choni sat down to have a meal and sleep overcame him. As he slept a rocky formation enclosed upon him which hid him from sight and he continued to sleep for seventy years. When he awoke he saw a man gathering the fruit of the carob tree and he asked him, Are you the man who planted the tree? The man replied: I am his grandson. Thereupon he exclaimed: It is clear that I slept for seventy years." Rabbi Shimon and his son went and hid themselves in the study hall, and his wife brought him bread and a mug of water and they dined. When the decree became more severe... they went and hid in a cave. A miracle occurred and a carob-tree and a wellspring of water were created for them. They would remove their garments and sit up to their necks in sand. The whole day they studied; when it was time for prayers they robed, covered themselves, prayed, and then put off their garments again, so that they should not wear out. Thus they dwelt twelve years in the cave. 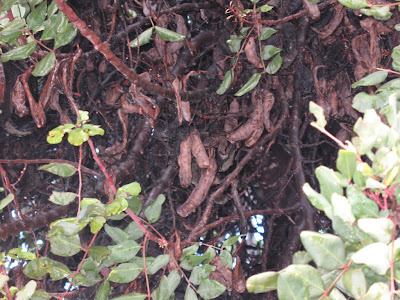 Ceratonia siliqua, the scientific name of the carob tree, derives from the Greek kerátiōn (κεράτιων), “fruit of the carob” (from keras [κέρας] "horn"), and Latin siliqua "pod, carob." The term "carat", the unit by which diamond weight is measured, is also derived from the Greek word kerátiōn (κεράτιων), alluding to an ancient practice of people in the Middle East weighing gold and gemstones against the seeds of the carob tree. The system was eventually standardized and one carat was fixed at 0.2 grams. In late Roman and early Byzantine times the pure gold coin known as the solidus weighed 24 carat seeds (about 4.5 grams). As a result, the carat also became a measure of purity for gold. Thus 24 carat gold means 100% pure, 12 carat gold means the alloy contains 50% gold, etc. 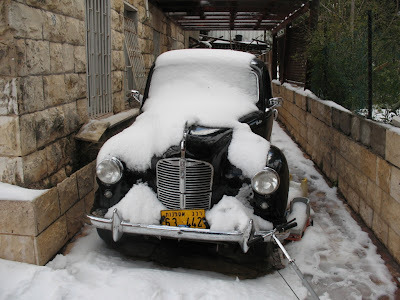 ראוי לאדם להתבונן במשפטי התורה הקדושה, ולידע סוף עניינם כפי כוחו. ודבר שלא ימצא לו טעם, ולא ידע לו עילה--אל יהי קל בעיניו; ואל יהרוס לעלות אל ה', פן יפרוץ בו. ולא תהא מחשבתו בו, כמחשבתו בשאר דברי החול. בוא וראה, כמה החמירה תורה במעילה: ומה אם עצים ואבנים ועפר ואפר--כיון שנקרא שם אדון העולם עליהם בדברים בלבד, נתקדשו; וכל הנוהג בהן מנהג חול, מעל בה'--ואפילו היה שוגג, צריך כפרה. קל וחומר למצוות שחקק לנו הקדוש ברוך הוא--שלא יבעוט אדם בהן, מפני שלא ידע טעמן; ולא יחפה דברים אשר לא כן על ה', ולא יחשב בהן מחשבתו בדברי החול. הרי נאמר בתורה "ושמרתם את כל חוקותיי ואת כל משפטיי, ועשיתם אותם" (ויקרא יט,לז; ויקרא כ,כב)--ואמרו חכמים ליתן שמירה ועשייה, לחוקים כמשפטים: והעשייה ידועה, והיא שיעשה החוקים; והשמירה, שייזהר בהן ולא ידמה שהן פחותין מן המשפטים. והמשפטים, הן המצוות שטעמן גלוי, וטובת עשייתן בעולם הזה ידועה, כגון איסור גזל ושפיכות דמים וכיבוד אב ואם; והחוקים, הן המצוות שאין טעמן ידוע. אמרו חכמים, חוקים שחקקתי לך, ואין לך רשות להרהר בהן. 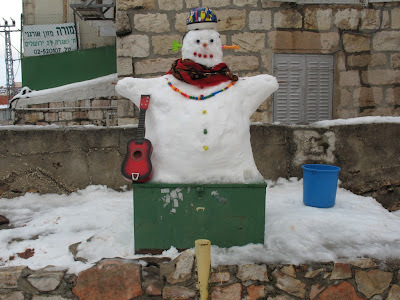 ויצרו של אדם נוקפו בהן, ואומות העולם משיבין עליהן--כגון איסור בשר חזיר, ובשר בחלב, ועגלה ערופה, ופרה אדומה, ושעיר המשתלח. 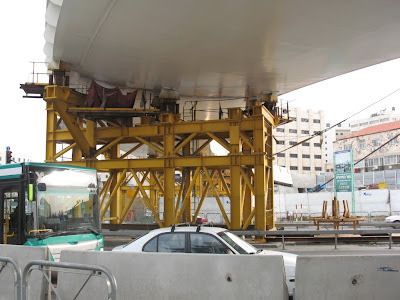 וכמה היה דויד המלך מצטער מן המינים והגויים, שהיו משיבין על החוקים; וכל זמן שהיו רודפין אותו בתשובות השקר שעורכין לפי קוצר דעת האדם, היה מוסיף דבקה בתורה, שנאמר "טפלו עליי שקר, זדים; אני, בכל לב אצור פיקודיך" (תהילים קיט,סט), ונאמר שם בעניין "כל מצוותיך, אמונה; שקר רדפוני, עוזרני" (תהילים קיט,פו). וכל הקרבנות כולן, מכלל החוקים הן. 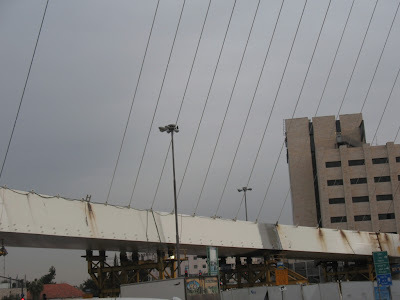 לפיכך אמרו חכמים שאף על עבודת הקרבנות, העולם עומד--שבעשיית החוקים והמשפטים, זוכין הישרים לחיי העולם הבא; והקדימה תורה ציווייה על החוקים, שנאמר "ושמרתם את חוקותיי ואת משפטיי, אשר יעשה אותם האדם וחי בהם" (ויקרא יח,ה). On the other hand, the alienation from the state rabbinical courts is also extreme. This system is forced on the entire population and its exclusive authority in divorce and personal-status cases results in bitter antagonism toward it. Mishpat VeHalachah BeYisrael is operating in cooperation with religious authorities, academics, and experts from the business world. The Torah has solutions to even the most complex, sophisticated problems of the modern economy, based on the principles of justice, honesty, and ethics. The court will apply the principles of the Torah and halachah in all aspects of public and commercial life and in the ever-changing modern world. The Mishpat VeHalachah BeYisrael court system gives a tool for solving a serious problems. The solution that is acceptable according to halachah and Israeli law and will make possible the issuance of just rulings based on Jewish law in a pleasant and efficient manner. Yishar Koach to Eretz Hemdah. In an article recently published in the Rosh Yehudi (Jewish Mindset) pamphlet, the Rabbi of Bet El and spiritual leader of the Religious Zionist movement, Rabbi Shlomo Aviner, called on Orthodox Jews to change their deeply entrenched prejudices against divorced women, and to start judging people based upon their character rather than their past marital status. Rabbi Aviner is that rabbi of Beit El Aleph. The rabbi of Beit El Beit is Rabbi Zalman Melamed. Rabbi Aviner is a spiritual leader of the Religious Zionist movement, but certainly not the spiritual leader of the Religious Zionist movement. It is interesting to note that the Hebrew version of this article did not have these errors.